We're 85% of the way to our goal! Help us reach it by donating Today! 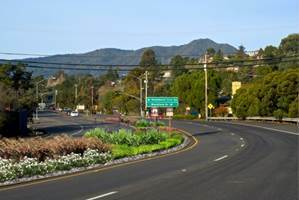 Ever noticed that Tiburon Boulevard medians are all nicely planted except the stretch by Blackfield Drive from Cecilia Drive to Bay Vista? This portion, which actually lies in the unincorporated County, is a concrete wasteland. It has a hard, neglected, urban look that constitutes an eyesore on our otherwise lovely peninsula. 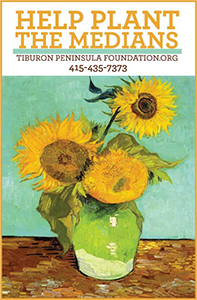 The Tiburon Peninsula Foundation is partnering with the Town of Tiburon and others to do something about this – together we hope to find funding partners to make green medians a reality this year. What would the project entail? The complete make-over of the medians involves removing the concrete from curb to curb, working around utilities to excavate the under-layers of rubble and dirt, replacing them with appropriate sub-base and soil, installing an irrigation system and of course installing plants. The cost of the project is estimated at $417,000. This is lower than previous estimates (which pre-dated detailed engineering), but still a significant sum. Why so high? Because the medians are so long! 1,770 linear feet! That means removing and importing a lot of material. Because it is in the Caltrans right of way and on a busy section of road, there is also the need for careful staging, traffic control and trenching for water supply in some locations. The Town already put $65,000 to this task for engineering, and has earmarked another $235,000 in next year’s budget for a total contribution of $300,000 or 72% of the project. Because the medians are in the unincorporated County, the Board of Supervisors, with Kate Sears’ assistance, is contributing $25,000. The City of Belvedere has been asked to consider participation, for this is its entryway, too. Terrific local volunteers, many of them veterans of the effort to create and maintain the existing planted medians, are involved as well to help fundraise to close the $92,000 gap. We are so close – success is within our reach! Optimism is running high for this community effort to beautify this neglected area once and for all. Because, really, are there any of us who would not prefer driving by beautiful flowering plants than a long stretch of lifeless concrete? Is that the front door we want for ourselves and our visitors for our otherwise beautiful corner of the earth? We think this is one of those simple but significant improvements that will benefit the quality of life for everyone who passes this way now and long into the future. Consider making a generous contribution today to make this a reality! Let’s make 2013 the last year of concrete medians on our beautiful peninsula.